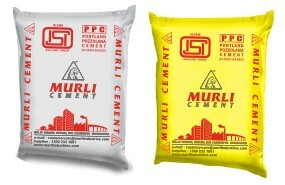 Murli Horse Power Cement / Cement Demand - Cement Supply / Murli Industries Ltd.
As you are aware the promoters of the Company has vast experienced in the production and marketing of various Agro-based products like Soya De-Oiled Cake, Refined Oil and Paper products like Duplex, News Print & Printing Paper and Printing Paper, Cream Wove, Map Litho Paper, Copier etc. The entire credit of the robust financial health of the company undoubtedly goes to their far-sightedness, prudent fiscal management, proficiency in handling industrial operations on a massive scale and a host of other attributes which are a pre-requisite for the success of any business. Dedicated 285 owned trucks for superior Logistics movement. High Quality raw materials sourced from dedicated Vendors. Geographically located at Chandrapur to cater Maharastra, Andhra Pradesh, Madhya Paradesh and Chattishgarh Markets. Fully Automated machineries with Zero error production line. Our Limestone stacker can blend Limestone Stockpile having more than 500 layers. Raw Mix Grinding Machine with High capacity Separators to give better particle size distribution which results in better burning efficiency. Online Auto Bulk Sampler to maintain quality of limestone stock. 10,000 Ton capacity raw mix blending silo for better Homogenizations of Raw Material. Biggest Pyroclone having Resistance time of 8.5 per second, which normally designed for 4 to 5 Seconds. In house, Ultra Modern Cement Quality Control Laboratory for ensuring Best quality Product to be marketed. Superior Cement Bag Packing facility to give weight accuracy with 0.002 % Variance. Implementation of SAP ECC 6.0 , right from the erection of the plant, ensures the highest level of accuracy at complete augmentation. In PPC cement, 10 - 25 % clinker is replaced by Pozzlons like Fly Ash and generally ground to higher fineness than OPC. In blended cements, sulphate attack is resisted because of the low availability of lime in the cement paste. Blended cement is having 4% lime compared to 31% of lime in OPC. Blended Cement is resistant to decay against animal secretions, acidic vapours from the exhaust gases of automobile etc. since it results in dense and impermeable concrete. Hence it is highly suitable for roads, flyovers, bridges, etc. 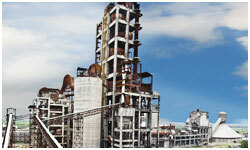 Murli Cement is widely used at major construction sites of Nagpur and vidharbha region. Our PPC cement is available at our 500 dealers network spread across Maharashtra, Chattishgarh, Madhya Pradesh and Andhra Pradesh. Very soon, our Cements will be available at Orissa States also.Our Product has made an introduction entry in North East Market and getting repeated orders afterwards. The source of Calcium is the Lime stone which constitutes 70-85 % of the raw material mix .Source of Silica is Mineral Clay or Sand or Shale (8-20%). Also Bauxite ore (2 to 4.5%) and Iron Oxide (0.5 - 6%) are added to improve certain properties .Also, Gypsum (3% - 5%) is added at the grinding stage To sum up, the raw materials are Lime Stone : 70 - 85 %,Silica : 8 - 20 %, Bauxite : 2 - 4 %,Iron Oxide : 0.5 - 6 %,Gypsum : 3 - 5 %. Joseph Aspadin of Leeds, England invented Portland Cement. In 1824, he manufactured cement, in a rudimentary form, by burning mixture of limestone and clay. After that, this cement is named as OPC with Lime stone as main ingredient. Limestone is a sedimentary rock, mainly composed of mineral calcite. It is a very useful mineral found naturally. The primary source of the Limestone is usually marine biology/marine organisms, which settle out of the water column and are deposited on the ocean floors .Chemically, Limestone is called Calcium Carbonate ( CaCO3). Generally, It is mined from the captive quarries of the cement plant. 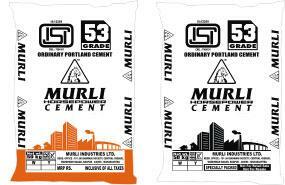 Murli OPC cement is known for the best quality, as it is made from the best lime stone available in central India. From the starting of production, consumers have accepted it’s OPC grade. Now OPC is available in 43 Grade and 53 Grade. And both these cement are supplied to our Trade and Institutional Buyer segment. It is also available at our 500 dedicated Dealers spread across Maharashtra, Chattishgarh, Madhya Pradesh and Andhra Pradesh. In the month of August 2010, Murli Cement has launched a new service for it’s customers through a Mobile Technical Assistance Van. Through this Mobile service, a customer can get following services at absolutely free of cost at their own sites. Free test with technical apparatus available. All these an happen with a simple telephone call at our Help line No .-1800-233-1801, With this Help line, one can put Enquiry, feedback and suggestions. Home Buidling guidance on different stages of constructions. Infrastructure and housing boom fueling cement demand. India has a large pent up demand for creating new and modernization of infrastructural facilities like Highways, Special Economic Zones, Power Plants, Ports, Airports etc. There is an acute shortage of housing in most cities in India. The sustained GDP growth over 8% in the recent years has generated on-going investments in industrial projects across India. In FY07, the available operational capacity was 159 million Tonnes. Against this the domestic consumption was 149 million tonnes and exports of 9 million tonnes, showing a capacity utilization of 99%. The regional play and historic industrial licensing policy created several small units owned by regional small companies. Progressive liberalization leading to total de licensing has coincided with major growth in demand. This has led stronger player to set up(and expend) plants of large capacities. There has been consolidation at the top through acquisitions, participating by multi national giants such as Holcim and Lafarge and our Indian giants like the Aditya Birla group. High capacity utilization helped firm prices in the years 2006-07 and boosted cement company profits and valuations. This has led to several existing players (and some new ones) announce plants for new green field and brown field projects. It is projected that about 80 to 90 million tonnes of new capacity would be set up by FY09-10, taking the total capacity to about 240 million tonnes. Future cement demand to follow GDP growth and exceed if India follows the Chinese model! India has registered over 8% GDP growth in the last two years. There is universal belief that this momentum is irreversible. Such a sustained growth requires enormous construction work and hence corresponding cement supply. Development momentum, as seen in china could be set the construction activity at a faster than economic growth to serve as a leading charge.